Don Dunbar, Ripley County Council President called the meeting to order promptly at 7:00 PM with Council Members Dephane Smith, Juanita Bauer, William Dramann, David Simon, Lawrence Nickell and Edward Armbrecht in attendance. Council Member Simon made the motion to approve the minutes from March 16th, 2004 seconded by Council Member Bauer. Motion approved unanimously. Council Member Bauer made the motion to approve the additional appropriation of $200,000 for Secure Detention Fund #100-39801-000-018/Commissioners from County General and seconded by Council Member Smith. Motion approved unanimously. Council Member Smith made the motion to approve the additional appropriation of $30,000 from Edit Fund/County Commissioners for the Community/Park Building at the Ripley County Park and seconded by Council Member Simon. Motion approved by four (4) council members (Smith, Nickell, Dunbar & Simon) and 2 voted against (Bauer & Armbrecht) 1 abstain (Dramann). Armbrecht/Bauer wanted the minutes to show that the reason they voted NO is that this has nothing to do with employment. Larry Eaton updated the council members on the river boat distributions from Rising Sun. The Auditor/Ohio County reported that the revenues have declined 15% the past two years. Mr. Eaton and the Clerk Treasurer of Ohio County will meet and go over the distributions. Council Member Smith made the motion to approve the additional appropriation of $65,000 for Fund#100-28200-000-014 Inmate Medical & Dental/Bill Davison, Sheriff of Ripley County (bills for the rest of 2004) from County General and seconded by Council Member Dramann. Motion approved unanimously. Council Member Bauer made the motion to approve the additional appropriation of $2,509.44 from Fund #277- 11260-000-045 Emergency Telephone/Judy Schebler/911 Communication Coordinator to increase Schebler’s Salary to $32,000 and seconded by Council Member Simon. Motion approved unanimously. Schebler will bring an amended salary Ordiance to the next meeting in May. Council Member Smith made the motion to approve the appropriation of $40,043.29/Ohio County /$39,453.66City of Rising Sun/River Boat Checks and seconded by Council Member Nickell. Motion approved unanimously. Pat Thomas, Ripley County Health Department updated the council on mileage rate increase from $.30 to $.34 effective January 1st, 2004 per the State Travel Policies and Procedures. Council Member Armbrecht made the motion to increase the county reimbursement rate to $.34 and seconded by Council Member Simon. Motion approved unanimously. Council Member Smith made the motion to return the Ripley County Community Foundation interest check of $10,840.49 to foundation, so that it can be spent within the foundation per the donor advised agreement seconded by Council Member Nickell. Motion approved unanimously. Volunteer sub committee was set up as follows Commissioner Robert Reiners & Council Members Juanita Bauer, Dephane Smith & Donald Dunbar. Council Member Bauer made the motion to approve $1,000 from the Ripley County Foundation interest check for Reward Riding Program/Impressive Dogwood Horse Ranch (riding lessons & equipment) seconded by Council Member Smith. Motion approved unanimously. Council Member Armbrecht advised that contracts need to be updated so that riverboat money (45,000) can be distributed to the Fire Department/Task Units. Attorney Comer will work on this matter for the Council. Council Member Dunbar suggested that maybe the county needs to talk to Dearborn County about a sharing plan outside its boundary and to match Ohio County distribution to Ripley County. Economic Development/Chuck Folz reported they meet the second Tuesday of the month. Solid Waste District Committee/Donald Dunbar/Sat. April 24th is recycle day. EMS Advisory Committee/Dephane Smith/ No Report. 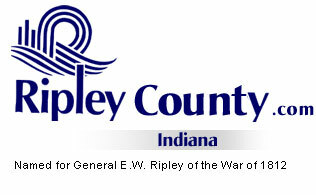 the 18th of May, 2004 @ 7:00 PM in the Ripley County Annex seconded by Council Member Dramann. Motion approved unanimously.